Thunbergia natalensis is a popular, fast growing garden plant. occurs naturally along forest margins, in bush and in grassland. It occurs in the higher summer rainfall areas of South Africa, and is adapted to dry winters by going dormant. The dwarf thunbergia is a shrub up to 1 m in height. The slender stems arise from a woody base and are mostly unbranched. The leaves are dark green, ovate (slightly broader at the base) to elliptic (broadest part of the leaf is in the middle) in shape and the margins may be toothed. The leaves are arranged opposite to one another on the stems. 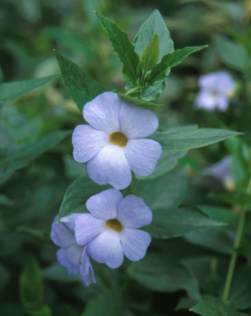 The flowers are large, tubular, pale blue to mauve with spreading lobes. The tube is bottle-shaped and yellowish-white inside. Flowering takes place throughout summer. Dwarf thunbergias are deciduous on the Highveld and will tolerate frost. Cut back old stems to ground level when they get untidy. You will be rewarded with fresh new shoots emerging in spring. Thunbergia natalensis is not threatened. The natural distribution ofThunbergia natalensis is throughout the eastern regions of South Africa, from the Eastern Cape, through KwaZulu-Natal, Mpumalanga, Swaziland, Northern Province, Zimbabwe and north into east Africa. It occurs naturally along forest margins, in bush and in grassland. It occurs in the higher summer rainfall areas of South Africa, and is adapted to dry winters by going dormant. The genus is named in honour of Swedish Botanist Carl Thunberg who travelled as a doctor with the Dutch East India Company ships and did extensive botanical exploration in southern Africa. The specific name is derived from the province of Natal (now KwaZulu-Natal), where the plant occurs naturally. The seeds of Thunbergia natalensis are borne in club-shaped capsules that explode when ripe, scattering the seeds. In Anne Hutchings' book "Zulu Medicinal Plants", it is reported that to ensure that her marriage is a happy one, a Zulu bride may be given an infusion of the roots on her wedding day. Dwarf thunbergias may be propagated by seed in spring. Sow in trays of seedling mix with a light covering. Be careful never to let the trays dry out completely. Stem cuttings may be taken in summer. Use a soft wood-rooting hormone. Choose a shady position for planting out. This plant is well suited to mass plantings under trees, and will form a dense cover. The pale flowers are very striking against the lush, dark background of leaves. The best results are obtained with a light, well drained soil and plenty of compost. Water well in summer. Thunbergia natalensis is cultivated in the Waterwise Demonstration Garden at the Witwatersrand National Botanical Garden where it is particularly suited as it is dormant during the dry winter and does not require extra watering. What is the relationship between T. natalensis and Barleria monticola - they seem so similar. Thunbergia natalensis flowers have a longer tube, and are solitary, attached by quite long pedicels to the stem, whereas Barleria monticola flowers have much shorter tubes and are attached right up against the stems. Thunbergia has 2 large bracts that hide the calyx. Barleria tend to have bracts and calyx lobes that are often leaf-like, sometimes with spines. Thunbergia has a corolla tube that is longer than the corolla lobes. Thunbergia flowers are usually regular with 5 lobes whereas Barleria are irregular, have 4 or 5 lobes, and are sometimes 2-lipped and the corolla lobes are often unequal. Thunbergia has 4 stamens in pairs, and no staminodes. Barleria has 2-4 fertile stamens and 0-3 staminodes, and the stamen filaments are long and twisted and cross over each other. Thunbergia plants don’t root at the nodes.